PhD in Theoretical Particle Physics, Cambridge University, UK, 1959. Prof. Riazuddin is a distinguished theoretical physicist who was a pupil of late Nobel Lauriate Prof. Abdus Salam (1926-2001). He is the founder of the National Center for Physics (NCP), Islamabad, and has been its director since 1999. His current research interest is focused on gauge theories and phenomenology of particle interactions. He also dedicates a great deal of his time to the promotion of science in his country. Professor at King Fahd University of Petroleum and Minerals, Dhahran, Saudia Arabia, from 1982 to 1998. Visiting Professor at the University of Iowa, Iowa City, USA from 1981 to 1982. Visiting Professor, Virginia Polytechinic Institute and State University Blacksburg, VA, USA, from 1980 to 1981. Visiting Scientist at the International Center for Theroetical Physics (ICTP), Trieste, Italy, from 1979 to 1980. Principal Research Associate, Daresbury Nuclear Physics Laboratory, UK, 1972. Visiting Professor at the University of Maryland, College Park, Maryland, USA, from 1970 to 1972. 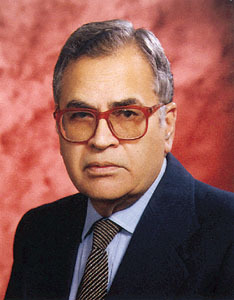 Professor at the University of Islamabad (now called Quaid - e - Azam University) from 1966 to 1981. Research Associate at the University of Pennsylvania, Philadephia, USA, from 1965 to 1966. Visiting Senior Research Assciate at the University of Rochester, Rochester, New York, USA, from 1963 to 1965. Reader in Physics at Punjab University, Lahore, Pakistan, from 1959 to 1963. The Gold Medal of the Pakistan Academy of Sciences (jointly with his brother Prof. Fayyazuddin), for outstanding research work in physical sciences in 1979. The Tamgha-e-Imtiaz and the Hilal-i-Imtiaz by the Government of Pakistan in 1980, 1990 and 1999. 13th Khwarizmi International Award (First Prize), awarded by the Iranian Government in 2000.
the UNESCO Albert Einstein Gold Medal for Fundamental Science in 2000. Fellow of the Third World Academy of Sciences in 2000. Fellow of the Islamic Academy of Sciences in 2000. Theory of Weak Interaction in Particle Physics, John Wiley, New York, 1969. (Written jointly with R. E. Marshak and C. P. Ryan). Quantum Mechanics, World Scientific, Singapore, 1990. (Written jointly with Fayyazuddin). A Modern Introduction to Particle Physics, World Scientific, Singapore, 1994. (Written jointly with Fayyazuddin). The book on weak interactions was regarded as a classic on the subject and received over 582 citation until 1996.